The Jaguar S-Type, introduced at the 1998 Birmingham Motor Show, was a mid-size luxury/executive car. The car went on sale 1999. The name was a revival of a previous Jaguar model, the S-Type introduced in 1963, while the bodywork appeared to have been inspired by the Jaguar Mark 2 of the same period. The S-Type was produced at Jaguar's Castle Bromwich facility in Birmingham, England. The car was styled by Geoff Lawson and is based on the Jaguar DEW platform/Ford DEW platform, which it shared with the now out-of-production Lincoln LS, but with substantial modifications. The first S-Types (1999-2002) are distinguishable by having the Jaguar logo on the bonnet above the radiator grille, and a U-shaped centre console inside. Subsequent models have the Jaguar logo incorporated within the radiator grille and a more traditional 'looped' styling for the centre console. The supercharged S-Type R joined the lineup in 2002, and the hope was that it would compete with BMW's M5 and the Mercedes E55 AMG. The R was powered by the newly revised 4.2 Litre V8 with an Eaton M112 supercharger producing 400 hp (300 kW; 410 PS) and could accelerate from 0 to 60 mph (97 km/h) in 5.3 s (0 to 100 km/h (62 mph) in 5.6 s). It included 18 in (457 mm) alloy wheels, wire-mesh grille and monochromatic paint. The R also has a rear apron, side-skirts, and front apron with built-in fog-lamps, a rear spoiler, a brace located near the rear subframe, and R badging on the boot lid and both front wings. It was the most expensive S-Type, with a base price of £50,040 in the UK (US$58,995 in the United States). Later models of the S-Type R featured a revised pulley system for the Eaton M112 supercharger allowing it to produce an extra 20 hp (15 kW; 20 PS). Also added on the 2003 model was an electronic parking-brake paddle-switch that replaced the conventional manually-operated lever for the rear brakes. 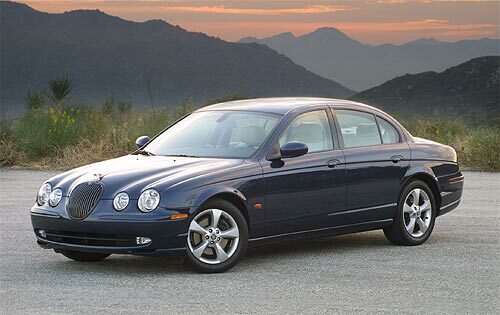 For the 2003 model year, the Jaguar S-type was given a 6HP26 6-speed automatic transmission as well as a revised 3.0 L V6 engine with 235 hp (175 kW) (US spec) versus 210 hp (160 kW) for the 1999 to 2002 models. The 2003 model featured a revised dash, instrument cluster and a grille with the Jaguar badge to give the vehicle a more Jaguar-like appearance. A minor facelift on the 2004 model year saw redesigned front and rear aprons, a slightly modified grille, remodeled rear light clusters, an aluminium bonnet, and a new 2.7 L V6 diesel engine with 207 hp (154 kW). The windscreen washer jets were incorporated into the windscreen wiper arms. Internally, the center console was redesigned to incorporate the revised switch-gear and radio (or optional satellite navigation equipment); the instruments were also redesigned.